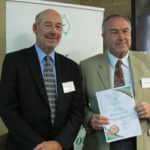 Professor Emeritus Robert (Bob) Gilkes, former Winthrop Professor of Soil Science and Adjunct Senior Lecturer, School of Earth and Environment at the University of Western Australia was recently presented with a Crawford Fund medal for his lifetime contribution to research supervision and mentoring of overseas students. 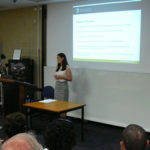 Over 60 people attended the presentation. 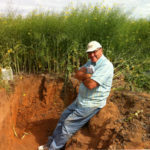 Prof Gilkes is a soil scientist with an international reputation in his field and has worked in areas covering soil mineralogy, fertiliser chemistry, mine site rehabilitation and management of soil, water and other resources. Since joining UWA in 1969, Bob has supervised 150 honours students and 66 PhD and Masters students. Of the postgraduates, 39 have been overseas students, and he has supervised a further 20 postgraduates based in Thailand, Iraq and Brazil. “The Crawford Fund’s training program has been successful because of trainees and trainers who are seeking to make an enduring contribution to global food security. Many go unnoticed and their contributions unheralded,” said Dr Denis Blight, Chief Executive of the Crawford Fund, who travelled from Canberra to present Bob with the award. “Students have been attracted by this high quality research, and his reputation as a wonderfully supportive supervisor,” she said. Reflecting the international standing he has, Bob is an Honorary Professor at Huazhong University in China and an Adjunct Professor at Kasetsart University Thailand. At the award presentation, the three Western Australian students who attended the Crawford Fund’s annual conference, held in Perth in late August, did short reflections on their experiences at the conference. “It was quite fitting that Bob gets to hear our Young Crawford Scholars as the topic of our annual conference – Mining, Agriculture and Development: Bread from Stones – is closely related to some areas of Bob’s research such as mine rehabilitation,” concluded Jen.